Anatomical Chart Company is a supplier of quality models, charts and other related items for a variety of academic, medical and legal professions. 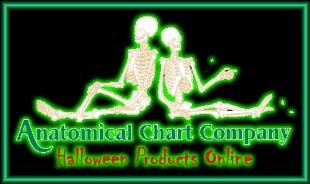 They do, however, provide a number of items of great use to Halloween fanatics. Anatomical sells 4th class full size skeletons, skulls, limbs and assorted bones at greatly reduced prices. These are items that are flawed during production and can't be sold at their regular 1st class prices. You can purchase 4th class items by contacting their Halloween Department at 1-800-621-7500x235 or by visiting Bucky's Boneyard for information on their Halloween products and specials.